St Matthew in the City, a progressive Anglican church in Auckland, New Zealand, has erected a billboard in support of a bill to legalise same-gender marriages. 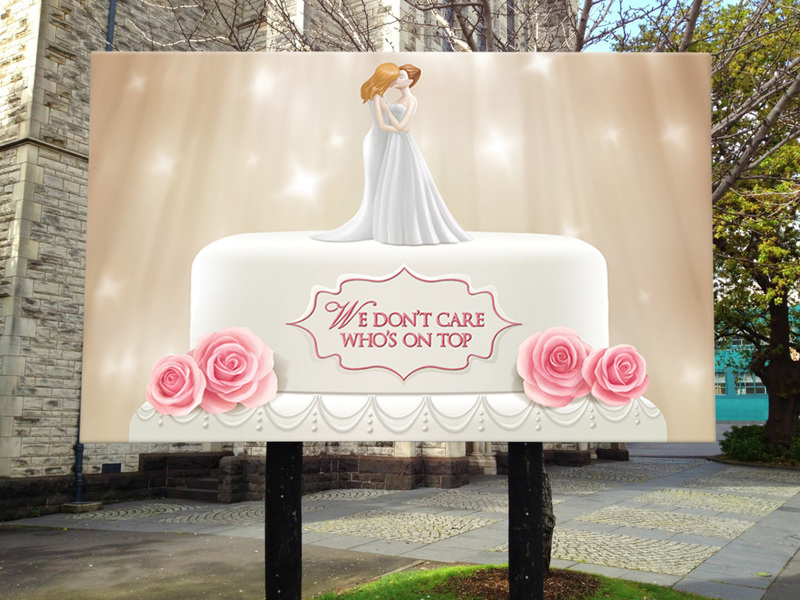 The billboard shows two model brides kissing on a wedding cake, with the text “We don’t care who’s on top”. St Matthew’s is supportive of Louisa Wall’s Definition of Marriage Amendment Bill, introduced on August 29 in the New Zealand Parliament. The Who Cares billboard was developed at TBWA\Whybin\Tequila, Auckland, by executive creative director Andy Blood, creatives Devon Wood, Stacey Vergis, retoucher Frank Turner, illustrator Elena Panaita, account manager Tineke van der Walle and producer Michelle Hong.